Meryl Streep as Gail Hartman in The River Wild, released in September, 1994. Meryl Streep is of German and Swiss heritage. Growing up in Basking Ridge, New Jersey, her mother Mary, always encouraged young Meryl to work hard and make her dreams happen. Meryl appeared in plays both in junior high and high school. Somewhat of a show-off, she began singing lessions at age 12, but quit after four years. After moving once more to Bernardsville, New York, Streep became a cheerleader and was the homecoming queen. Streep attracted a good deal of attention while attending Vassar College, where she starred in Miss Julie in 1969. She was very good at accents and could memorize her lines quickly. Upon graduation in 1971, Streep attended the Yale School of Drama, where she became so busy working odd jobs and doing plays that she thought of dropping out. She graduated in 1975. Fresh out of college, Joseph Papp cast Streep in a New York Shakespeare Festival production of Trelawany of the "Wells" on Broadway for 47 performances, in October and November, 1975. After seeing Robert De Niro in Taxi Driver (released in February, 1976), she decided to go into film work, auditioning for producers while playing Dunyasha in a NYSF revival of The Cherry Orchard for 62 perfs, from February to April, 1977. During that time, Streep's role as Michael Moriarty's girlfriend in The Deadliest Season aired over CBS in March, 1977. Streep starred in a Broadway musical by Kurt Weil and Bertolt Brecht called Happy End for 75 performances, from May to July, 1977, then she was cast in a small role in Julia (released in October, 1977) with Jane Fonda; Streep had a horrible reaction to the finished film, but Fonda encouraged Streep to keep with it, and became her champion. 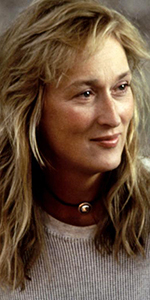 Despite her Emmy-winning performance in Holocaust aired over NBC in April, 1978, with James Woods, most people had never heard of Meryl Streep when they saw her in The Deer Hunter (released in December, 1978), with Robert De Niro. She was hailed as a luminous screen presence. After she took a supporting role as Woody Allen's ex in Manhattan (released in April, 1979), she made a surprising (and Oscar-winning) performance in Kramer vs. Kramer (released in December, 1979), opposite Dustin Hoffman. Streep now starred in several literary adaptations and roles where her character faces great hardship over the course of the story. She won an Oscar for The French Lieutenant's Woman (released in September, 1981), with Jeremy Irons, and went on to win another one for Sophie's Choice (released in December, 1982), with Kevin Kline; she kept going with Silkwood (released in December, 1983), with Kurt Russell, Out of Africa (released in December, 1985), with Robert Redford, A Cry in the Dark (released in November, 1988), with Sam Neill, Postcards from the Edge (released in September, 1990), with Shirley MacLaine, and The House of the Spirits (released in October, 1993), again with Jeremy Irons. And so the action thriller, The River Wild (which played the Chinese in September, 1994), with Kevin Bacon, opened up a new chapter for Streep; a chapter which saw her playing a romantic lead in The Bridges of Madison County (released in June, 1995), with Clint Eastwood, a music teacher in Music of the Heart (released in October, 1999), with Cloris Leachman, an author in Adaptation (released in December, 2002), with Nicholas Cage, a society woman giving a houseparty in The Hours (released in December, 2002), with Nichole Kidman, and played numerous roles (including Emma Goldman) in Amgels in America aired over HBO in December, 2003. In each of these films, she was usually nominated for the Best Actress Oscar or Emmy — standard operating procedure for Ms. Streep. With this kind of resumé, Streep came to be known for the kinds of films she agreed to be in. She narrated four episodes of Freedom: A History of Us aired over PBS in February, 2003, played a senator in the remake of The Manchurian Candidate (which played the Chinese in July, 2004), with Denzel Washington, played a ruthless fashion magazine editor (is there any other kind?) in The Devil Wears Prada (released in June, 2006), with Anne Hathaway, played a benefactress to a Chinese exchange student in Dark Matter (which premiered at the Sundance Festival in January, 2007), with Liu Ye, headlined the musical Mamma Mia! (released in July, 2008), with Pierce Brosnan. . . the list goes on and on. The list does go on and on. She played a peevish (and humanly real) mother superior in Doubt (released in December, 2008), with Amy Adams, played Julia Child in Julie & Julia (released in August, 2009), with Amy Adams, Margaret Thatcher in The Iron Lady (released in December, 2011), with Jim Broadbent, was in the ensemble peice August: Osage County (which at the Chinese during AFI Fest in November, 2013), with Julia Roberts, played a big bad Witch in the musical Into the Woods (released in December, 2014), with Emily Blunt, played Emmeline Pankhurst in Suffragette (released in October, 2015), with Carey Mulligan, and delighted everyone in the title role of Florence Foster Jenkins (released in April, 2016), with Hugh Grant. Working finally with director Steven Spielberg, Streep starred as Washington Post owner Katherine Graham in The Post (released in December, 2017), with Tom Hanks. Who knows what else this incredible performer has in store for us? Mann's Chinese Theatre, Hollywood, California. Meryl Streep Forecourt ceremony, Sunday, September 25, 1994. Meryl Streep smiles up at the cameras while placing her handprints in the cement.